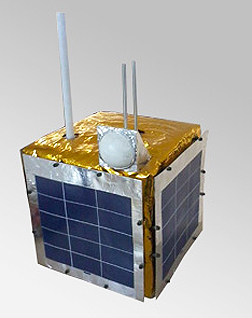 The SRMSAT is the first Nano Satellite of SRM University. It has been designed by students and faculties of SRM University. The design is made robust enough to support different payloads and act as a Nano Bus for further missions. By this process SRM University would be able to provide qualified and trained scientific and technological manpower in satellite technology. SRMSAT was launched on 12 Oct 2011 from SDSC-SHAR by PSLV C-18 with Megha Tropiques.